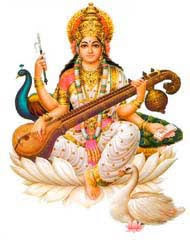 Vagishwari Jayanti is dedicated to Goddess Saraswati, the Hindu Goddess of knowledge, art and learning. It is observed annually during the Magh Shukla Paksha Panchami day. Vagishwari Jayanti 2019 date is February 10. This festival is of great importance in North India and it is believed that Goddess Saraswati appeared on this day on earth. The day is also observed as Basant Panchami, Saraswati Puja and Saraswati Jayanti. Vagishwari is one of the twelve names of Goddess Saraswati mentioned in the Suta Samhita of Skanda Purana. Devotees praying for knowledge invoke these twelve names of Goddess Saraswati. Yellow color is given importance on the day. Murti of Goddess Saraswati is decorated with yellow dress and flowers. All people invoke Goddess Saraswati for her blessings. Young children also begin to learn the art of writing on the day. Legend has it that Brahma completed creation on the advice of Vishnu. But there was gloom all around. Brahma approached Vishnu and told about the somberness among his creations on earth. Vishnu then asked Brahma to sprinkle some water on earth from his Kamandalu. When Brahma sprinkled some water on earth, from it appeared a Goddess with four hands. This Goddess provided speech, knowledge, intelligence and music to all living beings. Soon desolation and gloominess gave way to cheerfulness and happiness. The Goddess was given the name Saraswati and Vagishwari.